Scroll down for incredible video. A busy week for volcano activity as The Nevados de Chillán volcano is the latest to show activity. The activity at the volcano has again increased. While degassing and weak, sporadic ash emissions have become more frequent again since mid July, a more intense phase of activity took place yesterday: starting around 17:10 local time, the volcano erupted a dense plume of ash from the crater that rose several hundreds of meters to 3500-3600 m altitude and quickly dispersed. Ash fall occurred near the summit. The activity lasted a few minutes, but was the strongest since the volcano's activity in May this year, reports Volcano Discovery. The Nevados de Chillán volcano in the Bío Bío Region of Chile has been on and off degassing in 2016. Activity has increased there recently and yesterday the volcano began erupting ash, smoke and gases. Skier Jess McMillan was on the mountain taking some runs and caught the activity on video. McMillan is in Chile with Powder Quest, a company that runs snowboard and ski adventures in South America and Japan. Others are also at the resort, Nevados de Chillán, and have also documented the fumarolic emissions. 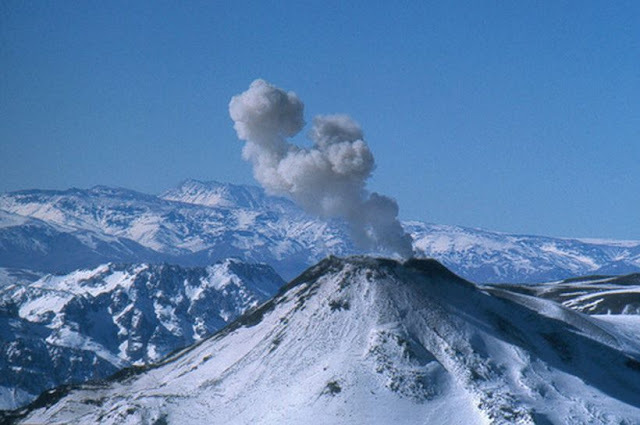 The website Volcano Discovery has a good log of the volcano's activity, and says that scientists had detected increased levels of sulfur oxide and earthquakes, and predicted that increased activity may be coming. Unsure if magma is present, it seems to be a situation not of immediate danger.